Legumes are plants which produce pods which split open naturally along a seam, revealing a row of seeds. Legumes (beans) produce their own nitrogen, and in fact they return nitrogen back into the soil when they die off. Beans are a great crop rotation plant to help maintain soil quality by replacing nitrogen back into the soil where the nitrogen has been depleted by other crops. Beans are rich in fiber, protein, antioxidants, and are low in fat. Beans are a very good food for the human diet and can be a healthy substitute for meat which has more fat and cholesterol. This year I have planted pole beans, a legume, wherever I had planted tomatoes last year. The plants continue to produce new beans throughout the entire growing season. In my opinion, beans, of which there are many varieties, are one of the best survival foods to grow in a survival garden. 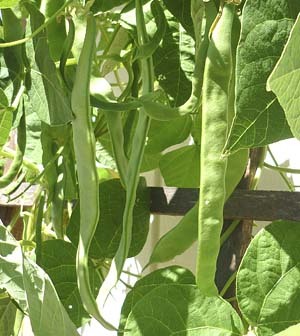 Beans are easy to grow and I suggest that anyone who is experimenting with growing their own garden be sure and learn to grow, harvest, and store beans. Most dry beans can be stored for years or even decades, helping to make them one of the best survival foods to keep in your preps. I like the pole beans because they don’t take much square footage when you have a small garden. Instead, they grow tall and produce all the way up the vine, leaving space on the ground for other plants. 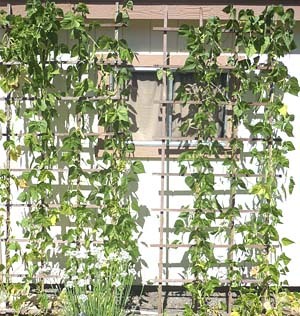 I have used several trellis to assist their upward growth. I have seen pole beans growing up makeshift strings attached between a ground support and a higher support. I have also seen simple tee-pee structures built of small wood poles which nicely support the upward growth of the pole bean plants. I suspect that you could also plant them along side trees and they would follow the tree trunk upwards. The bottom line is to strongly consider adding beans to your survival garden plans, due to their ability to add protein (and fiber and minerals) to your diet instead of meat, and their ability to restore nitrogen to the soil. I like meat just as much as the next person, but in TEOTWAWKI scenario, meat will be scarce and you will need some amount of protein in your diet. Beans are without a doubt one of the best prepper foods to have in supplies. Getting your family to eat them regularly translates into less issues later if the SHTF. It means rotating your dried beans and legumes is easier to do, which honestly is a concern because the longer a bean is stored in a dehydrated form, the tougher it is to rehydrate. As you rehydrate beans, the water that you soaked them in will have biochemicals that need to be discarded in some manner. Use that water to do something else in a survival situation. If you cook those beans in that soaking water, then it will make the skins tough. Most good prepper books have nutritionists as consultants. Why? The nutritionists remind us that for adequate protein intake, we need essential amino acids. These are the Lego blocks that form the proteins we ingest. They are called essential amino acids because our metabolic processes cannot rearrange those building blocks to make them. Other amino acids can be made internally through digestion and metabolism. You body takes building blocks, reaseembles them into precursor and intermediate states, then keeps combining them slowly until the proper proteins can be built to make hair, skin, nails, muscle, and so on. Why does this matter? A long time ago in tribal life, people saw nutritional defficiency diseases. That most often happened during the periods in which the tribe was living on stored provisions. As long as their diet was varied, they luckily got the essential amino acids that the tribes needed for growth and maintenance of their bodies. At times when they had to rely upon a monocrop of say beans alone, then they suffered ill effects. Today, nutrionists teach us to mix corn with beans or have beans and rice, and by doing that, you end up having a varied enough group of essential amino acids to make the proteins within your body. The main issue I see is that rice is not a crop that most preppers can grow. Some might be able to grow wild rice or at least gather it. However many preppers can grow corn to eat with their beans for a decent diet. That’s said with a caveat. Corn meal that we consume today undergoes a process called nixtalimization. Without that process, our digestive system cannot assimilate the proteins properly nor extract all of the vitamins. That results in the old and now rare disease of Pellagra. Note: the easiest legume to rehydrate are lentils. Have some on hand too. Both lentils and beans can be intentionally sprouted and this adds to the bioavailability of the vitamins and minerals within them. As such, sprouted beans might be served in salads for a meal that doesn’t have to be heated and is nutritious too.